There are hundreds of themes for any occasion, putting them together with the guidelines provided will make it easy to host one in an organized manner. Came up with some streamer ideas to make decoration fun and unique. How to keep the guests engaged with activities and the food options must be given thoughts too. I prefer the venue to be either at my backyard or home for an elaborate decoration. But we have hosted outdoor parties at parks too. When outdoors, more attention is given to the centerpiece and the table decoration. Would you like a birthday party table with only a huge yummy cake or with an attractive and memorable centerpiece along with it? A party table must be the highlight of any party, hence never keep it empty. A small display of toys, unopened presents can be displayed on the table with some confetti / flower petals. Even return gifts (if uniformly arranged) can be used on the table as a decor. Extra party hats especially masks gives a 3-D look on the table. Themed or color themed tableware with some unused streamer rolls tied to helium balloons would do the trick. For a grown up's party, candles in elegant holders, lanterns, flower bouquets or even unique collection of art piece (theme related) works well. Cake cutting table can be draped with a colorful plastic table cloth or find a cloth(curtain/sheet) that's appropriate with the same color theme (plain or subtle design works better ). I sometimes use my silk cloth that either blends with the theme color or as a striking contrast. Don't be afraid to use two different cloths draped on each other sometimes in an angle looks elegant. Surprisingly, paper gift wrapper can be unrolled as a tablecloth as well. I once draped a white gift wrapper and had the kids sign in with a piece of advice, wish or tip for the birthday kid. It is such a wonderful memorabilia! Let's get crafty with some of these streaming ideas... Streamers are so versatile with its color and different patterns. You must be wondering what can be different with the uniformly rolled streamer. There are ample ideas to create your unique decoration for your upcoming party. For chained streamers check out my Color Themed Party - Blue and Green. Some of the streamer garlands are ruffled streamers or twisty, fringe, chain , tasseled, honeycomb (using crepe paper) and much more. There are two ways to make ruffled streamers. One is to sow the streamers with the simple pleated pattern. I have used a large width blue streamer and a small width green streamer layered on top. The streamers are pleated for about 4-5 inches, then press using finger tips to hold in place. The basic running stitch using your sowing machine will be perfect to create this ruffled pattern. If you are not into sowing, the next best and next easy method is to grab a good pair of scissors and cut the ends on either sides leaving the center to be attached or just on one side alone. For the twisty garland, fold the ends of large streamer lengthwise to the center and fold again so the seams are tucked inside. Now give a good press to stay intact. Attach one end on to the wall using a tape or push pin. Start twisting until the length you have precut. 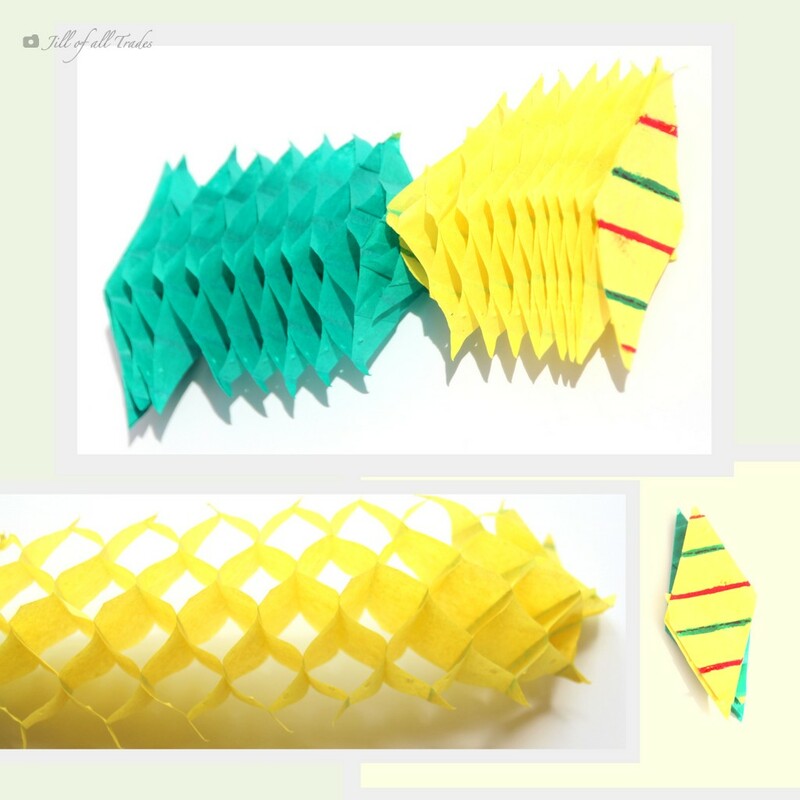 Honeycomb streamers are made using decorative tissue paper. They are cut to the desired shape either a rhombus or oval shaped. Then stack them up neatly, gluing them alternatively in 2-3 different spots. The picture will guide you through this. The green and the red lines marked are glued alternatively. Trust me this is time consuming and requires a lot of patience. Now the pictures speaks, there are various patterns I came up with, which seem to be easy nevertheless some are time consuming. You may pick what works for you. For the tassels, grab your pair of scissors and make strips (3-5 inches in length) at the ends. These bottom strips can be twisted for a different effect. The tops can be twisted and tied to a curling string or hang on a curtain rod or simply tape it to the wall according to the height you desire. Tassel on curtain rods at the entry or window sill or as part of the back drop. More the merrier is the thumb rule. You may chose warm, cool or even contrasting colors like these. I have layered the yellow tassel streamer below for a dramatic look. Patterned streamers can be made using a desired length of streamers folded into 2-3 inch square. Find the center and fold again to cut any small shape or pattern you like using scissors. Punching machine works like a gem to make patterns. The punched out scrap was reused as confetti. You can create any backdrop image using these streamers like castle/fort, surf boards or underwater plants with few tiny fishes and bubbles like different sized circles (ocean theme), web or octopus (on ceiling). You might want to check out my Spidey Birthday Decor, where unused streamers were stacked up for an effortless way to bring in some height and color. Balloons can be stringed into a garland, or a simple straight lined above the cake cutting table or even randomly attached to the ceiling upside down can be appealing. Balloons can be hung at the door entrance along with streamers upside down to feel welcoming. Large and small balloons(water balloons filled with air) of same shape gives a good dimensional look on walls if gathered in large numbers. Once you start into it, you might not when to stop, ideas keep flooding in as I start to blog. If interested in detailed post on balloons or any similar decor ideas, please leave a comment/suggestion below. I would love to share more only if this inspires my readers. Enjoy getting crafty and do share your creative side with us. Let's create lasting memories to cherish for years!